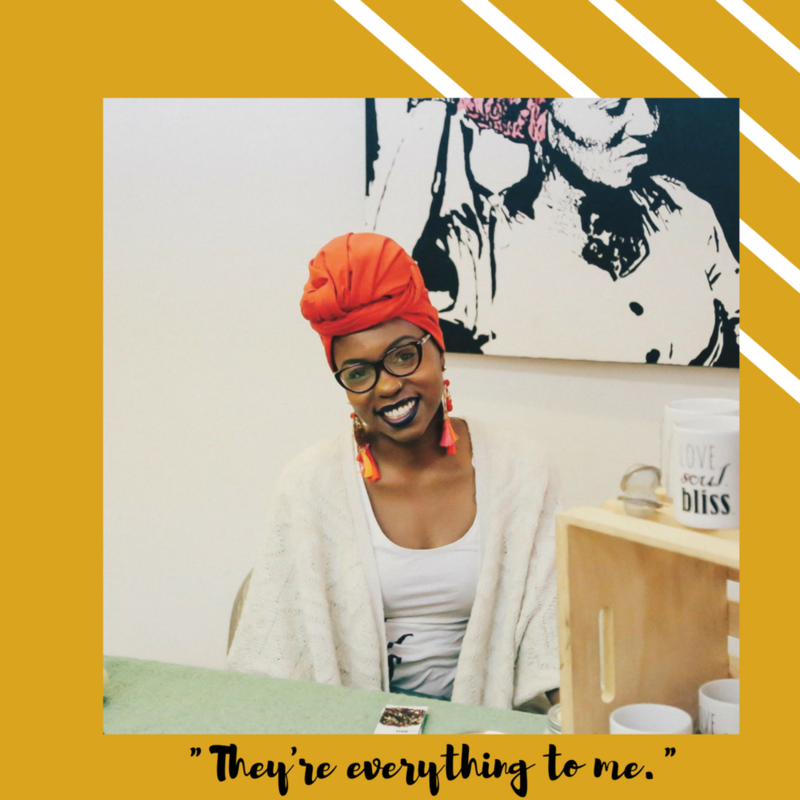 I was super honored and excited to have Ashley from Soul Bliss be the feature for this month’s installment of “How I Got Over”. She just celebrated her 1-year anniversary of her company and is working towards some amazing things for the second year! I am a part of the #SOULBLISSHIVE and I love all of her products. I ask her the usual questions but also included some about her business. Her journey and story are so beautiful and truly an inspiration. Like I always say it’s a blessing to have friends who don’t mind shining their lights onto you so that you can shine even brighter, Ashley is a true testament of that. A: How do I answer that? Lol I’m just here, flowing. I’m a sister, daughter, aunt to 5 amazing humans, a friend, a business owner, a healer, a part-time vegan, a sometimes yogi...I’m just me. K: Are you who you thought you’d be? Why or Why not? A: I’ve been in a very reflective state over the last few months - thinking about where I was 5 years ago, 3 years ago, 7 days ago even. I’m always growing and changing and I had no clue I’d be this person. It wasn’t my “plan” but I’m a much better me than I would’ve thought. A: One thing that has never changed is that I’ve always known this life, for me, is about helping people. How I have and will do that while I’m here will continue to change and evolve but it is always the foundation of what I do. A: I’ve been abused. I’ve used alcohol to cope with and escape life. I’ve been abandoned by my father. My older brother was murdered when I was 16 and he left behind 3 kids so I’ve stepped into roles that were far beyond my years and responsibilities. I’ve treated myself poorly because of what I’d been through, how I grew up...the list goes on. Losing my grandmother started me on a healthier path (she died from a brain aneurysm from high blood pressure) because she was “young” when she passed. At 23, I’d lost my last living grandparent and I realized there wasn't anyone in my family over 70 and that that shouldn't be the norm. I’d had enough and decided to give myself more. There was a snowball effect there - me paying attention to my salt intake and stress levels in 2013 led me to a holistic lifestyle. I stopped playing victim. Those things happened but now what? Now you get into healthy eating, yoga, meditation, nature, therapy, and more. Now you do everything you can to be happy and live well, you deserve it. K: Share your light (quote, song, lyric, photo, memory). I call my nieces and nephew My Kids because they’re my babies and I’m not a typical aunt. I’ve lived with some of them, I’ve gone to their parent-teacher conferences, I’ve helped with college essays, stepped in when they were bullied… They’re everything to me. They’re my light. K: What was the moment when you realized that Soul Bliss was needed and had to be created? A: Other people saw it before me. They’d see me making products for myself on social media, come to my house and drink tea I’d made, and I’d give them things as gifts. They kept saying I should sell everything and one day it finally clicked that 1. I could share these things AND 2. I could get paid for doing what I love doing everyday - living my life. K: What is the purpose of Soul Bliss? A: Soul Bliss is a source for the soul & overall wellness. We have natural and handmade body products, teas, tinctures, and other apothecary items, I do consultations and one-on-one sessions, events, custom orders, etc. If I don’t do it, I’m able to point you in the direction of someone that does. K: Now that it’s been a year, what have you learned about having your own business? A: Pros and cons? Lol we don’t have the kind of time to list what I’ve learned BUT - you’ll learn a lot, you’ll make mistakes, you have to outsource, delegate, and ask for help, don’t overthink, don’t be too hard on yourself and take care of yourself. It is very easy for those of us who take care of others to neglect ourselves so I schedule in time for me. I have a morning wellness routine written in my planner and take myself on dates...I treat myself well...really well. K: Anything new coming (that you’d like to share)? A: We’re re-launching this Spring! New products, new packaging, and our own site lovesoulbliss.com in addition to the current etsy shop. We’ll also have some wellness events coming up and we post everything on IG so you can follow for updates! I got to chat with a good friend of mine about her journey. Here is the first installment of How I Got Over, a monthly series that highlights people of Color and how they got over. I believe that we all have the ability to rise above our past pain and trauma. I am interested in seeing how others got over as an inspiration, a bit of wisdom, and comfort. KC: Okay so boom...Who are you at this very moment? LS: I'm....figuring that out day by day. I thought I knew who I was beyond the roles I occupy, but WHEW the universe has shown me that I don't yet all the way know. i am, however, a mom, a wife, a friend, a sister, and a community builder. KC: Totally understandable. It feels like a never-ending journey huh? KC: Are you who you thought you’d be? Why or Why not? LS: When I look back to when I was a kid, thinking of who I'd be when I grew up.... I'd say I'm close. I knew I always wanted to be married and to be a mom, so that's worked in my favor. as a kid, I always thought I'd be a writer or a teacher, and well..............apparently I do both of those things, just not in a traditional way. I saw myself being a lot more confident in myself than I am at this moment, but that's a work in progress. KC: Wow, you've achieved some of your goals, that's amazing. How do you teach and write? Sounds fulfilling. LS: It's crazy, I never thought of being a mom and a wife as goals that I had, but.......I thought wrong LOL. They really were, and I know that being a family woman is part of what I was brought here to do. I look at myself as a teacher and writer in a non-traditional sense. With my forthcoming business/group Salve for Your Wound, I'm positioning myself as being a mediator of sorts...with a blog to boot. That'll give me the space to write about what I see fit as it relates to self-healing and healing collectively, and some of those blog posts will teach someone something, I'm sure. Eventually, I'd like to teach my own classes......about what, I'm not sure yet, but there's something brewing in the back of my head. KC: Lauren, you are a true light. It's a blessing to not only know you but to hear your story. I like to think that we all rise above. Rise above past pain, trauma, and hurt through our light and darkness. So, how did you get over? LS: The feeling is mutual, Ka'Lyn. I'd like to say that I just....got over, but I know that's not the truth. The negative things that shaped me the most were the sexual abuse I endured and the loss of 3 of the most important people in my life, all before the age of 16. It took until I was 30 (so just LAST YEAR) to be free of the shame and guilt that came with those things. It took a lot of turning the mirror inward...looking to see where I could and still can reclaim some of my power and take it back from those that sought to destroy me. It took the love of amazing women in my life to be safe spaces when I needed somewhere to land. It took the love of my now husband, who saw me through some of the darkest times in my life, and reminded me that I had everything I needed within myself to overcome absolutely anything life threw at me. And it took looking in my daughter's face - to know that I am leading her by my example, and she deserves to see her mother overcome and work with her darkness, rather than to pretend it doesn't exist. I really do it all for my team. Us 3. And well...as soon as you asked that, the lyric "there are times...when you'll need someone...I will be by your side....there is a light, that shines...special for you and me..." popped into my head, so I'll go with that. I really do live by that with all my friends, my family, and the people in my group. I'll be there when you need me. Lauren's message was quite powerful. How have you gotten over? Comment below!